The GST Council has formed two GoMs for further examination of GST on real estate and uniformity of taxation on lottery and other issues arising out of lottery. The GST Council relaxed the tax exemption limit to Rs 40 lakh from the earlier cap of Rs 20 lakh during its 32nd meeting on Thursday. The all-powerful panel also decided to extend the composition scheme to traders from informal sector rendering services or mixed supplies with a turnover up to Rs 50 lakh. Briefing the media after the meeting, Finance Minister Arun Jaitley said that the threshold limit has been doubled to Rs 40 lakh from Rs 20 lakh. The exemption limit for small states has also been increased to Rs 20 lakh from Rs 10 lakh. "The states will have the discretion to opt up or opt down the exemption limit. They will have to inform the Secretariat within a week if they wish changes in their exemption limit," Jaitley said. The exemption limit is the threshold of annual turnover above which companies have to mandatorily register under the GST regime. Regarding exemption limit, a dual threshold system is maintained, a lower cap for North-eastern and hilly states flagged as special category states and a higher one for the rest of India. 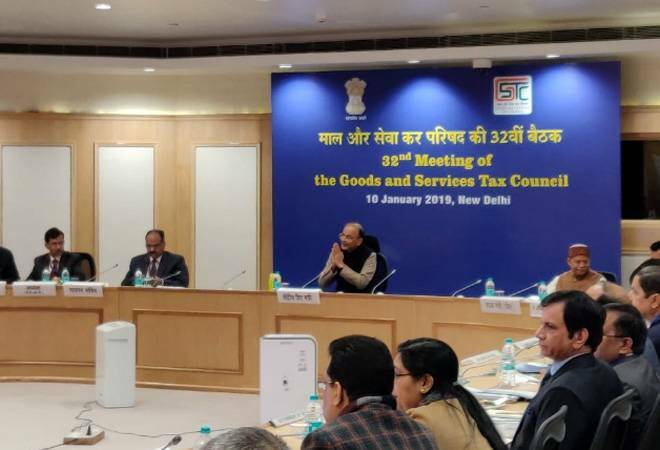 The GST Council also decided that service providers and those who render mixed supplies of goods and services with a turnover up to Rs 50 lakh in the informal sector will be entitled to the composition scheme under the GST regime. The composition rate for service providers in the informal sector has been pegged at 6 per cent. "This 6 per cent is lower than the service tax paid by service providers with turnover up to Rs 50 lakh," Jaitley said during the media briefing. In the meeting today, the GST Council also decided to allow Kerala to levy a cess to cope up with the natural calamities it faced last year. The southern state was ravaged by the worst floods it had seen in years, leaving a property worth crores in shambles. Kerala will now be able to impose a cess of 1 per cent on intra-state sale of goods and services for a maximum of two years. There is a provision in the GST Act which allows the Council to permit cess for coping up with natural calamities, Jaitley said. The two items which did not see a decision today were GST on real estate and uniformity of taxation on lottery or other issues arising out of lottery, due to "diverse opinions" on these matters. Two ministerial panels have been formed to take a closer look at these items before they can be taken up again by the GST Council. "A seven-member GoM has been formed to look into the GST on real estate. Another GoM with representation from lottery developing and selling states will be formed for uniformity of taxation on lottery or other issues arising out of lottery. These ministerial panels will give their recommendations in the next meeting," the Finance Minister said. In its previous meeting, the GST Council had slashed tax rates on seven items previously placed in the highest tax slab. Rationalising the 28 per cent tax slab, the council had pruned the GST rates on six items to 18 per cent slab and one item to five per cent slab. In total, the panel had reduced rates on 23 goods and services. 03:10pm: Service providers and those who render mixed supplies of goods and services with a turnover up to Rs 50 lakh in the informal sector will be entitled to the composition scheme under the GST regime. The composition rate for services has been put at 6 per cent, Finance Minister Arun Jaitley said. 03:15 pm: This 6 per cent is lower than the service tax paid by service providers with turnover up to Rs 50 lakh, Jaitley added. 03:18 pm: The GST Council has extended the exemption limit under the GST regime to Rs 40 lakh from Rs 20 lakh. For hilly and small states, the exemption limit has been extended to Rs 20 lakh from Rs 10 lakh. 03:20 pm: If small states wish to increase their exemption limit from the revised 20 lakh to Rs 40 lakh, they have been given the discretion to opt up, Jaitley said. They will have to inform the Secretariat within a week. 03:20 pm: Kerala is now entitled to impose a maximum cess of 1 per cent for two years on intra-state sales, the Finance Minister said. This has been done to help the state cope up with natural disasters, as per the provision of the GST Act. 03:22 pm: There were diverse opinions on items related to real estate and uniformity of taxation on lottery or other issues arising out of lottery, Jaitley said. 03:22 pm: A seven-member GoM has been formed to look into the GST on real estate. Another GoM with representation from lottery developing and selling states will be formed for uniformity of taxation on lottery or other issues arising out of lottery. These ministerial panels will give their recommendations in the next meeting, the Finance Minister said. 03:25 pm: Each one of these decisions today are meant to help the SMEs, Jaitley said. 03:26 pm: The issue of real estate was sent to GoM because it needed deeper examination, Jaitley said.